Repair, replace, rescind or reconcile, whatever your view of the ACA, at present it is still in force and must be complied with. Part 1 discussed the who, when and how of compliance. Part 2 will discuss the penalties associated with failure to comply. This is especially timely with year-end 2019 fast approaching because employers who fail to comply, or fail to comply on time, or fail to properly document their compliance face stiff financial penalties. Penalties apply to employers who fail to offer any coverage, or who offer coverage that does not provide Minimum Essential Coverage (MEC) to at least 95 percent of their full-time workers. Penalties also apply to employers whose coverage offerings fail to meet a standard for quality and/or affordability. And then there are the non-filing penalties. How the “sledgehammer” penalty is Calculated in 2019: This penalty is imposed on employers who fail to offer any coverage. Employers subject to this penalty will pay $2,500 per year for each full-time employee after excluding the first 30 full-time employees from the calculation. So, employers who are subject to this penalty will be charged $208.33 per month per full-time employee. Keep in mind that the ACA considers “full-time” any employee who works at least 30 hours per week or more on average during the designated period. 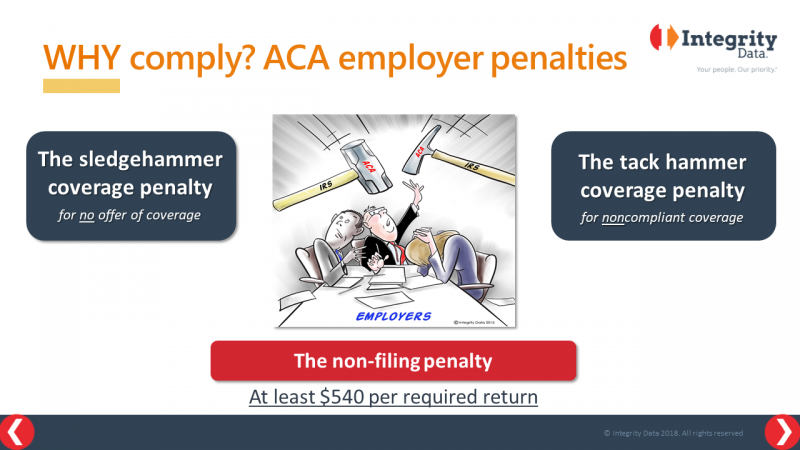 A lesser penalty applies to employers who offer a health plan that does not meet ACA standards – either for quality or affordability: the so called “tack hammer” penalty. How the “tack hammer” penalty is calculated in 2019: An employer subject to this penalty will pay $3,750 for each Full-Time employee (if they obtained a subsidy on an exchange) after excluding the first 30 Full-Time employees from the calculation. So, employers who are subject to this penalty will be charged $312.50 per month per eligible employee who is subject to the penalty. The exception to this penalty is that the total amount must not exceed the amount the employer would have paid as a penalty for offering no coverage at all. So, there is a financial break, as far as penalties are concerned, for offering even minimal coverage. This penalty also makes an exception for any full-time employee who is in a Waiting Period. The third type of penalty applies to employers who fail to comply or fail to properly document their compliance. This is the Non-Filing Penalty. Employers who fail to file year-end 1095-C and 1094-C forms with the IRS will be penalized a minimum of $540 per eligible employee. This penalty is similar to the one for failing to file W-2 forms for employees. Here’s the question you’ve been wanting to ask: Given the current confusion and debate around ACA, is the IRS really going to enforce these penalties? YES!!! The IRS has clearly indicated that it won’t waive employer mandate penalties under the ACA. A significant number of employers who have failed to file necessary forms with the IRS in 2015 and 2016 have received letter 226J aka “a penalty letter” from the IRS – here’s some advice on what to do if you get one of those. And remember to reply within 30 days! Once you have sent your thoughtful response to the 226J letter, the IRS will respond with a 227 letter. There is no doubt 2017 – and later 2018 – will be next. Do you need help understanding ACA requirements or getting started with compliance? Watch our on-demand webinar or contact us at sales@integrity-data.com or call (888) 786-6162.